Tony (James Fox) a wealthy young Londoner, hires Hugo Barrett (Dirk Bogarde) as his manservant. Initially, Barrett appears to take easily to his new job, and he and Tony form a quiet bond, retaining their social roles. Relationships begin shifting, however, and they change with the introduction of Susan (Wendy Craig) Tony's girlfriend, who seems to be suspicious of Barrett and to loathe all he represents. Barrett brings Vera (Sarah Miles) whom he presents as his sister, into Tony's household as a maidservant, but it emerges that Vera is actually Barrett's lover. Through Barrett's and Vera's games and machinations, they reverse roles with Tony and Susan; Tony becomes more and more dissipated, sinking further into what he perceives as their level, as the "master" and the "servant" exchange roles. In the final scene, Tony has become wholly dependent on Barrett, and Susan is exiled permanently from the house. Losey's other collaborations with Pinter, Accident and The Go-Between, share a resemblance to The Servant in that they offer the same savage indictment of the waning English class system, a theme which British film-makers had not previously explored. The soundtrack, by John Dankworth, includes the song "All Gone", sung by Cleo Laine, which is used repeatedly in the film. Folk guitarist Davy Graham makes a brief cameo playing the song Rock Me Baby. ^ a b Nick James, "Joseph Losey & Harold Pinter: In Search of PoshLust Times", BFI, British Film Institute, (last updated) 27 June 2007, Web, 19 June 2009: "From Venetian decadence and British class war to Proustian time games, the films of Joseph Losey and Harold Pinter gave us a new, ambitious, high-culture kind of art film, says Nick James." Billington, Michael. Harold Pinter. London: Faber and Faber, 2007. ISBN 978-0-571-23476-9 (13). Updated 2nd ed. of The Life and Work of Harold Pinter. 1996. London: Faber and Faber, 1997. ISBN 0-571-17103-6 (10). Print. Gale, Steven H. Sharp Cut: Harold Pinter's Screenplays and the Artistic Process. Lexington. Kentucky: The UP of Kentucky, 2003. ISBN 0-8131-2244-9 (10). ISBN 978-0-8131-2244-1 (13). Print. Gale, Steven H., ed. The Films of Harold Pinter. Albany: SUNY P, 2001. ISBN 0-7914-4932-7. ISBN 978-0-7914-4932-5. Print. "Harold Pinter & Joseph Losey", by Jamie Andrews, Harold Pinter Archive Blog, British Library, 15 June 2009. 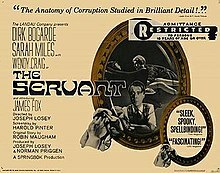 The Servant at AllMovie – Includes "Plot synopsis"